IMF staff earlier this month proposed that the yuan be added to the basket of currencies used to value the SDR, a reserve asset created by the institution in 1969, and today that decision is confirmed (as expected). The IMF’s Executive Board decision today means that the yuan will be included in the SDR basket from Oct. 1, 2016, effectively anointing the yuan as a major reserve currency and represents recognition that the yuan’s status is rising along with China’s place in global finance. However, as politically-motivated as this decision may have been, now comes the hard part for China. The inclusion puts new pressure on Beijing to change everything from how it manages the yuan, also known as renminbi, to how it communicates with investors and the world. China’s pledges to loosen its tight grip on the currency’s value and open its financial system will come under new scrutiny. While IMF inclusion is largely symbolic, it could open Beijing to criticism of its financial policieswhen the fund conducts its five-year review of the currencies in its basket. Formally, inclusion would add the yuan to the IMF’s special drawing rights, or SDRs, a virtual currency IMF uses for emergency lending to its members and countries can use to bolster their reserves. In the near term, inclusion would lead to a modest, less-than-$30 billion in new foreign demand for yuan-denominated assets, estimates Zhang Ming, a senior economist at the Chinese Academy of Social Sciences. “Domestically, it’s far from certain whether the SDR status could force other, structural overhauls,” Mr. Zhang said. SDR status doesn’t require central banks to hold yuan but could be a catalyst for portfolio reallocation. Reserve managers for countries having strong trade and funding ties with China have the strongest incentive to increase yuan holdings. Reallocations by central banks may be gradual to minimize disadvantageous market pricing. Reallocations by private investors will be constrained until capital controls are lifted and transparency improves. SDR weights since 1978 have been based on a country’s relative share in reserve holdings by monetary authorities and the value of exports of goods and services. Preliminary estimates in August from the IMF put the yuan share of the SDR basket in a range between 14% and 16% depending on whether the yuan would be added as a fifth currency or replace an existing currency. Based on the latest available data, the euro appears likely to lose the largest ground in the IMF’s new SDR basket. The weights of the SDR basket create no formal obligation on the part of the IMF’s 188 members to hold a similar proportion of international reserves. Indeed, the IMF’s Currency Composition of Official Foreign Exchange Reserves report — a confidential survey on the composition of central bank reserve holdings — indicates a preference, in aggregate, to hold a much larger share of the dollar and pound. The reduction in dollar portfolio allocations from the IMF’s recognition of the yuan as a reserve currency may prove larger over time than the change in the SDR basket would suggest. Dollar allocations may face greater downward pressure simply because they are so large relative to other currencies — more than three times the size of euro holdings, for example. Part of this disparity is valuation, a reflection that the dollar is trading at a 12-year high against the euro. The dollar has increased 21% in trade-weighted terms over the last five years, according to Bank for International Settlements’ calculations of nominal effective exchange rates. However, as Bloomberg concludes, the ability (and risks) are near-term constraints on any major re-allocations. The willingness to hold more yuan and less dollars is one thing; the ability to execute is quite another. At the moment, the ability of private foreign investors to increase their yuan allocation is limited by China’s capital controls. There are special arrangements for foreign central banks that give them enhanced access to China’s foreign exchange and interbank bond markets. Another hurdle for expanding yuan holdings is the perception of a lack of transparency and market manipulation by the Chinese authorities. Until access and perceptions change, these factors will slow the flow into the yuan. The depth and security of U.S. government bonds may also constrain switches out of dollar assets. Central banks tend to adjust reserve allocations slowly, so as not to pit market pricing against them. This suggests a steady gradual stream of demand for yuan assets over time. Until portfolio rebalancing is complete, dollar rallies may be short-lived as these may be seen as attractive opportunities for investors in both the public and private domain to trim dollar exposure. As finally, before everyone gets too excited – The history of yen internationalization offers a cautionary tale on hopes for the yuan. Japan’s experience suggests that a floating exchange rate, free cross-border flows and stable economic growth are all necessary for successful internationalization. The challenge for China will be hitting all three of those criteria. Currency internationalization comes in three stages. The first is use in trade settlement and financial transactions. Second is providing a safe asset for investment by non-residents. Third is to serve as an anchor for the regional and — ultimately — global market. In the 1980s and 1990s, the yen made rapid progress from stage one to stage two. Since then, it has stalled and even started to retrace its steps in some respects. 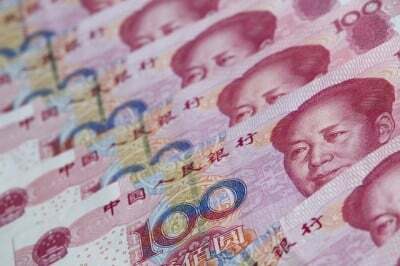 Any positive reaction on yuan’s possible inclusion in IMF reserves to be short-term, given that the outcome was well priced in, says Jason Daw, head of Asia currency strategy at Societe Generale SA in Singapore. It would be most ironic, however, if China achieves its ultimate objective, which is simply to find foreign buyers for its currency as an offset to domestic outflows, which in turn sends the Yuan soaring beyond its pre-devaluation levels, thereby slamming the Chinese economy even further and assuring that the unfolding Chinese hard landing becomes a full-blown global crash.